Riders from FPW Racing had a sucessful visit to Silverstone, all achiveing great results which lead to another great update from the team, enjoy! Taz Taylor secured second spot with easily his best performance of the season onboard his Luyten powered FPW Racing RS125 Honda. After laying out the foundation for a great weekend in Fridays Free Practice sessions Taz went into qualifying buoyed by own performance. During Qualifying Taz tried hard in the very difficult wet conditions setting the seventh fastest lap of the session. The conditions were horrendous with continuous rain, standing water and cold temperatures all combining to reduce grip levels and making it difficult to get the best out of the machines. The second qualifying session of the day was cancelled after the programme suffered lengthy delays due to said weather. and tag onto the back of the group racing for third that contained team mate Jayson Uribe and Jordan Weaving. The third lap of the race was something special as Taz carried unbelievable corner speed to take both Uribe and Weaving in one move round the outside. Unable to respond, Taz was able to pull clear of the chasing pack and focus on holding his pace and securing his highest placed overall finish. By ending the race in second, Taz has secured his and the teams 2nd place in the championship. Jayson yet again never fails to amaze! Silverstone may not be the best place to spectate but to ride it has everything, from technical linked corners through to uber-fast flat out bends. Jayson progressed through the friday sessions in his usual consistent and no-nonsense approach. Posting the sixth fastest time in both sessions Jayson was looking confident to improve for Saturdays qualifying. Conditions on Saturday are what I guess most of the American population believes the UK is like 365 days of the year, Cold and Wet. In reality it was colder and wetter than any preconceived conception could have visioned and for the Californian something far from the norm. This made Jayson’s final placing in the session even more special as he used his ability to grasp a front row slot with the third fastest time in Q1. With Q2 being cancelled due to the horrific conditions, something Jayson was happy to take, Jayson had secured his first front row start of the season. Sundays warm up was something of an oxymoron, as it was anything but a warmup as the temperatures across the circuit were bitterly cold as Jayson went on to post the forth fastest time. As the lights went out for the penultimate race of the season Jayson got away well and held his position in the frantic opening corners of the race. Locking bars with Jordan Weaving for the entire race it was a case of give and take as both riders tried to break away from the other. as they battled for third and then forth (after loosing touch with Taz Taylor). The TV cameras were watching the battle closely and Jayson got plenty of coverage as he tried everything, everywhere! The duo were joined by the Dutch race Jorel Boerboom, who added a third dimension to the tussle. With each rider leading the trio a some point on each lap the race it was hard to see who would lead them over the line on the final lap. Unfortunately it wasn’t going to be Boerboom who high-sided and came down hard on lap nine forcing a premature end to the race. Clearly frustrated by the sight of the red flags Jayson had to settle for fifth overall and the final spot on the Moto3 podium. Jayson had risen well and was lining up Weaving for a final lap manoeuvre that never came to fruition. 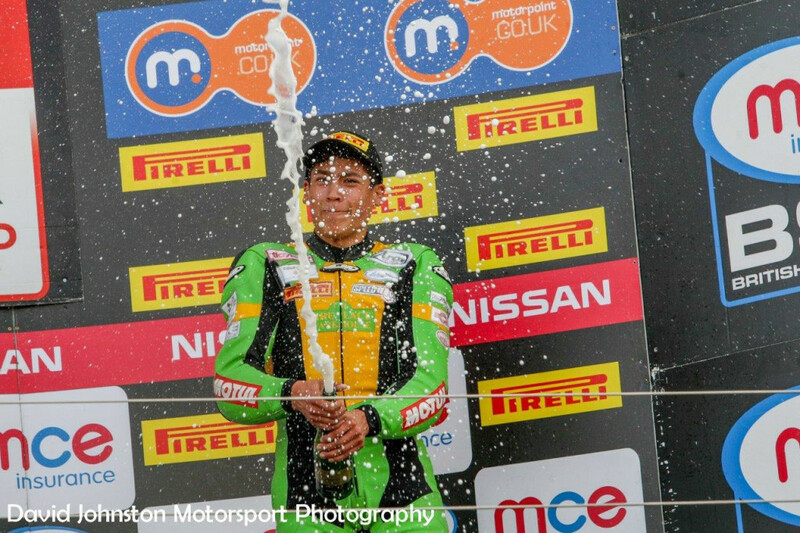 Once the duct had settled though, Jayson was happy with the result and securing third in the British Motostar Moto3 championship. Greg rolled out onto the Northamptonshire circuitfor the first time Friday morning and I cannot explain how difficult it is to learn a circuit and getup to race pace , something Greg has done several times throughout this season. Silverstones 3.67 miles have a real mixture of track features with everything from tight hairpins like “The Loop” through to super fast complexes like “Maggots” and “Beckets”. After suffering and electrical issue in the first free practice session after only recoding three laps, Greg had lost valuable track time. Greg built up his pace in Fridays second Free Practice sessions and it was great to see his improvements in time as the 20 minutes of track time came to an end. Ending the second free practice session in 19th Greg had made a huge step forward and was certainly happy with how the day had ended. Saturdays torrential rain was not what Greg wanted as it just meant Greg now had to learn the circuit over again. Silverstone suffers with a lack of gradient and leads to standing water in several locations around the circuit and it takes time to know where these are. That said Greg did a great job to end the session in 22nd and was looking forward to getting back out in the afternoon to build on this when the news came in that the second session was cancelled due to the conditions affecting the days schedule. going to help Gregs cause and he accepted that this was the best he could of hoped for. Going to Brands in two weeks time Greg can still take fifth in the 125GP Championship will only 10 points separating him from Elliot Lodge. Opie Oils sponsors FPW Racing had a fantastic weekend of racing with the exception of Taz Taylor who suffered a cruel blow during the race. After each event we FPW Racing always write an excellent race report, enjoy! Sometimes things just gel. 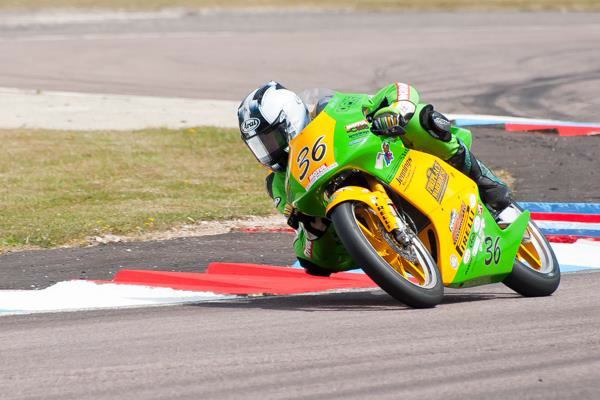 From the second Jayson swung his leg over the FPW Racing Moto3 machine he was right at the sharp end. Friday was a very productive day with two very quick Free Practice (FP) sessions. One noticeable change to Jayson this weekend was his consistency. Building up speed with each lap, Jayson was able to string together multiple quick laps rather than relying on one or two laps during a session. This was just what the team had wanted to see from Jayson and he delivered. In Qualifying Jayson continued this good run of form and effort. In a very strong Q1 session, Jayson was on the pace from the very start, managing to end the session in 4th place with a lap time of 1:47.238. In Q2 Jayson, like many of the other riders was unable to improve on his time from the morning session but this had no impact on his grid position. As the remnants of a tropical storm passed over Oulton Park in the morning for the warm up session, it was great to see Jaysons form was not just confined to the dry. His pace in the wet was blistering too, ending the eight minute period in 6th with an average lap speed in excess of 80 mph. After the race start was delayed due to torrential rain, it was calming for everyone involved to finally be called to take to the grid. As the lights went out it wasn’t the greatest of starts for Jayson, as he ended the first lap in the difficult conditions in 7th. Unable to make any headway Jayson became comfortable with the conditions before deciding to pull the pin on lap six, going almost two seconds a lap faster than his previous laps Jayson was able to pull out a gap on championship leader Jordan Weaving. With just two laps remaining in the shortened race it looked as though Jayson was going to make the move on Ed Rendell but as the trio drove hard out of Old Hard for the final time it was Weaving who snook through on Jayson while he looked to make the move on Rendell. This unsettled Jayson’s rhythm and he was left to cross the line with a very hard fought third. This was edge of your seat racing from 15 year old racer – superb and well done! 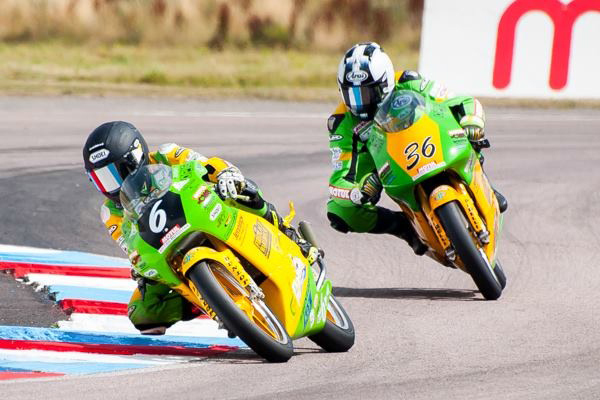 Daniel came to the UK to race two stroke bikes in the most competitive European class. He did this to improve his riding and take his sponsors bike to the very limit. Coming to the UK and running with some very quick riders has some downsides especially when you’re arriving at circuits you’ve never seen before. Having already spent a weekend at Oulton earlier in the season this was Daniels weekend to prove his ability to his piers. Unfortunately though this weekend was going to test Daniel and his group of mechanics to their limits. With perfect conditions for FP, Daniel went out and struggled in both. In the first session he struggled with visor issues then didn’t have the perfect run in the FP2 as jetting hampered his top end speed. Going into Qualifying Daniel had high hopes, but these were soon dashed as his primary engine suffered a mechanical. After swapping the engine out Daniel again struggled to get the best out of the machine and ended the session with a best lap of 1:52.236 leaving him 21st on the grid. Daniels troubles didn’t end there. In morning warm up on race day he suffered brake issues in the very wet conditions. Having inspected everything it wasn’t clear what the issue was with the brake, but when the same problem appeared on the warm up lap Daniels heart sank. Entering the pit lane he spoke with his mechanics who attempted to trace the problem. Thoroughly annoyed, Daniel started the ten lap race from pit lane with no idea whether his brakes were good or not. What happened next is what’s racing is all about. Daniel took to the track and threw caution to the wind, riding to the limit in the conditions Daniel was able to pass riders as though they were somehow limited on power. In the opening three laps, having lost a good 10 seconds at the start, Daniel was able to make up seven places. Two laps later he’d made another seven places and was visibly faster than those in front. On lap six, Daniel passed team mate Greg Greenwood, and slotted into 12th place. By now the riders around him weren’t that much slower so making the moves to overtake was that little more difficult. This didn’t stop Daniel and by lap eight he was up to 10th, a position he held onto easily until the end of the race. The question now stands, what was he capable of had he started off the grid? This was a fantastic effort in such difficult conditions! 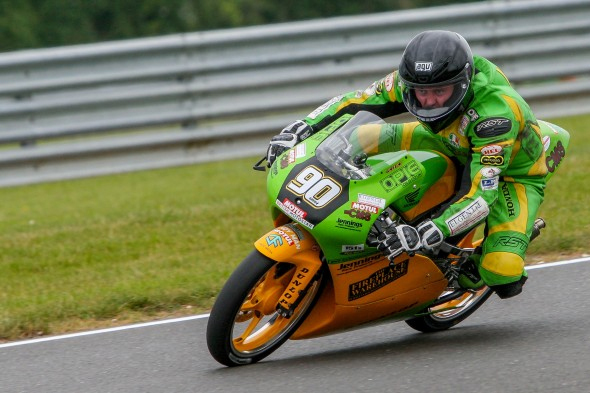 Daniel moves up to 11th in the British 125GP championship. Greg was happy to arrive back at Oulton, a circuit he was families with having just raced at two new circuits in the previous two rounds. This comfort didn’t manifest itself straight away as he struggled to match his previous times from earlier in the season in the FP sessions. Going into Q1, Greg knew his bike was quick enough from the speed trap measurements from Friday and to improve he’d need to make more time in the corners. In near perfect conditions Greg made a solid attempt to improve his grid position during Q1 and Q2. Ending the first of the two Saturday timed sessions with a lap of 1:53.628, Greg was provisionally 23rd on the grid. For Q2, Greg was looking to make a step in the right direction and he bettered his lap time by 0.3 of a second. Unfortunately though for Greg he lost another two grid places mean ping head start the race from 25th. On a good note though Greg had gone 1.4 seconds faster around Oulton park than he’d ever gone before! Waking up to heavy rain was the alarm call Greg had been hoping for. Rain levels the playing field and rider ability shines through. With a consistently wet track Greg was aware of bringing it home safely in morning warm up but was pleasantly surprised with his suspension settings working to end the session in 16th. Starting from 25th, was never going to be easy for Greg, as making the moves on riders in the wet needs to decisive as theirs no room for error, it’s not like you can grab a handful of brakes when the track is so wet. After the 30 minute delay to the start (due to flooding of the circuit) Greg made a good start a and after the first lap he was up to 20th, another two riders were passed on lap two. This progression up the field continued and by lap-five Greg was up to 15th overall. With teammate Daniel Hermansson right on his tail Greg was eager to stay ahead, but the shear anger driven pace of Hermansson was just too much for Greg and the Swedish rider went past on lap-six. Now in a battle of three as Jake Archer joined in the action the trio pushed on hard for the remainder of the race with each one looking to make moves hold on the others. Greg crossed the line in a career best 12th overall, 5th 125GP, which was a fantastic result and a real bonus for the Lancastrian who has worked so hard on a minimal budget. 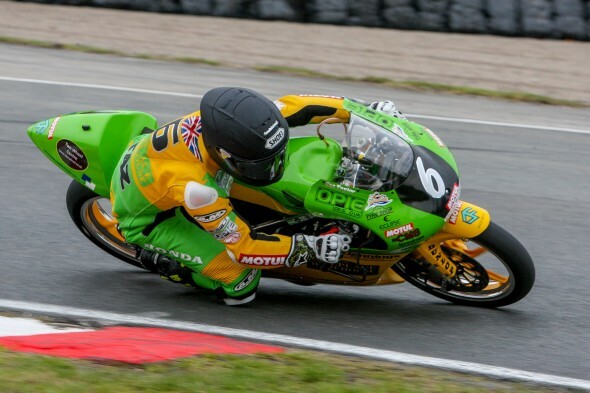 Greg takes a big step up the table into 8th in the British 125GP Championship. Greg Greenwood: “We had a few niggles throughout the start of the weekend and through into qualifying but when it came to race day it went really well. I had a great opening couple of laps and I was happy with how the bike was responding in the wet. With such good feel I was able to pick off riders quite easily as the race progressed. Finishing 5th in the 125s and 12th overall was just the best way I could ever imagined to end the weekend, thanks to all of the FPW Racing team for their support this year”. Taz arrived at Oulton full of confidence and this was immediately evident in his performances in Free Practice. Taz ended the opening FP session in second and forth in FP2. The pace this weekend was electric from the off and times were certainly quicker than previous years of this championship. Saturday didn’t start as planned though as Taz’s bike suffered an electrical issue that was untraceable in the time frame. Missing the session was a big deal for Taz as the track time is so limited during these British Championship events. The lost time could easily of dampened Taz’s enthusiasm but his willingness to succeed shone through as he took to the track for the second qualifying session. With a first flying lap in the 1:48s it was evident that Taz was focused and the issues were behind him. After a short pit stop early in the 25 minute session Taz was back out and within a lap was right on the leaders pace. Ending the session in fifth with a time of 1:47.343 was a superb result for the youngster from Mansfield. Just to add, the time set by Taz was six-tenths of a second faster than he had ever done around Oulton Park. In the very wet conditions of morning warm up Taz looked really comfortable and set a time of 2:00.562 without really pushing it. So he was confident he could race right at the front in what looked to be the weather for the day. With the 30 minute delay pushing the start time back to 3pm it was good to see Taz drop in directly behind teammate Jayson Uribe as they entered the first corner of the race. In the opening two laps Taz matched the pace of Uribe with both passing South Aftican Jordan Weaving on lap-3. However on lap 5 Taz lost tabs with his team mate and Weaving in the tricky conditions. As Taz attempted to regain the lost ground he lost the front end and slid out of contention. This was a very unlucky end to the weekend especially after showing such good form all the way through the weekend. 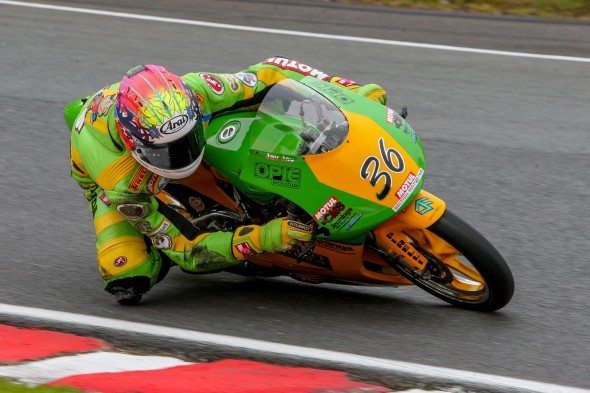 Taz remains second in the British 125GP Championship. Thanks for another excellent race report, we look forward to reading and sharing the next one! After this weekends of racing Opie Oils sponsored FPW Racing have sent in this fantastic report, enjoy! 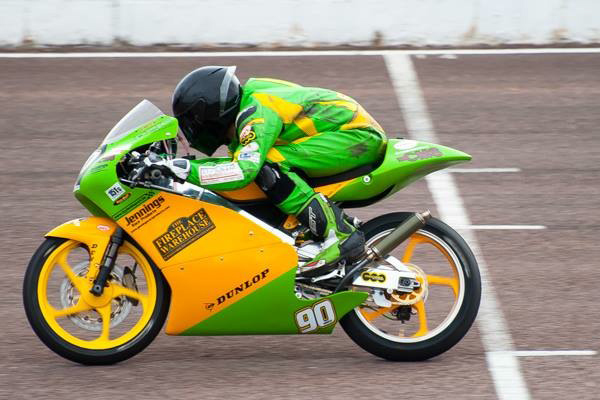 Thruxton is a fast, fast circuit, where the riders are expected to average in excess of 100mph for the 2.35 miles lap. Taz had a scary start to the weekend in Free Practice after coming into close company with Jordan Weaving at one of the fastest sections of the track. This didn’t last long though and Taz was up in fifth by the end of the second session on Friday. ! The weather played its part in Saturdays qualifying. Q1 started in perfect conditions and after bettering his lap times with each consecutive lap Taz set a lap time of 1:23.442, just 1.5 seconds off pole position and the highest placed FPW Racing machine. Taz was obviously happy with this and when the weather turned horrific for the afternoon session with torrential rain the times from the morning set the grid positions.! After loosing out on the second qualifying session and a steady morning warm up practice, Taz went out for the race confident he had what it takes to take his first win in the 125GP class. After a half decent start, Taz lost a place into the first series of chicanes. By lap three Taz was part of 5 rider group looking to take the third place in the race. The group that included team mate Jayson Uribe, plus Ed Rendell, James Hobson and the dutchman Mike Brouwers. With Joe Irving and Jordan Weaving having made the break early on, Taz was looking to get to the front of the group and break away, but that was easier said than done. Swapping places multiple times a lap the group of five was great for the spectator but made it extremely difficult to break from the group. Taz had found himself in every position within the chasing pack from third to seventh all in a single lap, such was the enthusiasm of the overtaking. At the start of the final lap Taz was trailing the group int to the final chicane. Luckily though for Taz, Jayson ran wide and messed up the final series of corners. This allowed Taz a better drive to take fifth in the race and second in the 125GP class to Rendell. As a conciliation for not taking the win, Taz set the fastest 125GP lap of the race with a 1:22.087. 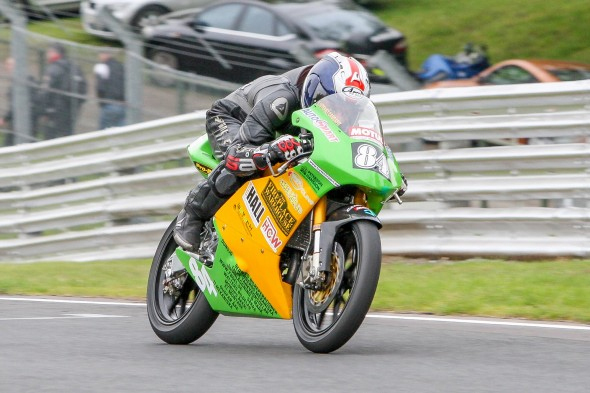 After Jayson had pulled together a hard fought result at Brands Hatch after not the best of weekends he was clearly focused to better things in Hampshire. Fridays free practice went perfectly with Jayson never more than 8 tenths of a second off the fastest lap. This was just the confidence boost that the youngster needed to go into Saturdays qualifying. In qualifying Jayson was straight into the groove and was pushing the from his fifth lap of the session. With each subsequent lap Jayson managed to knock off tenths here and there to end the session with 1:23.342. Going into the race Jayson was more than aware how this race could be won or lost and the slipstreaming effect would be critical. Within the first couple of laps, having lost touch with the leading duo of Irving and Weaving, Jason was looking to take the final spot on the podium in the Moto3 championship. Jayson worked endlessly to battle with a group of 5 riders who were all looking for that very same spot of tarmac. At moments the five riders were all looking to take different lines into the corners after securing different degrees of slipstreaming on the approach, some of which Jayson benefited from and others he didn’t. It was great to watch from the trackside as nothing was gained for free. This was very much a learning experience for Jayson who adapted his lines and technique throughout the race as he noted what had worked and what had not. Jayson was in the perfect position going int the final lap to take the final spot on the podium having worked so hard to be trailing James Hobson onto the final straight. As Jayson took advantage of the slipstream he chose to take the outside route around his fellow Moto3 competitor. Unfortunately for Jayson, Hobson attempted the same manoeuvre on Ed Randell which left the Californian having to take to the curbs. Unsettled and unable to drive out of the corner Jayson had to settle for 4th in the Moto3 classification. This was a good result for Jayon as he maintains a strong hold of third in the championship. Jayson remains 3rd in the British Moto3 Championship. Greg arrived at the Hampshire circuit having never seen the 2.4miles of circuit before. This is a real issue at a circuit where the average lap is in excess of 100mph for these small capacity machines. Looking to get as much time on the treack as possible in the lead up to the race Greg built up his pace steadily through the Friday Free practice sessions. Unfortunately his second session was hampered by an electrical issue that cut his session short. For Greg though he was happy with the time he had spent on the circuit and was clearly blown away by the shear speed of the circuit. During Friday night Greg sat down and watched the footage from Taz’s onboard video camera and picked up loads of valuable information to take into Saturdays qualifying. During qualifying Greg went almost four-seconds faster having used the video to pick better lines, braking points and speeds through corners. This was a great improvement and Greg was confident that he could go faster still in the afternoon session. Any hopes of this materialising ended when the heavens opened and soaked the track for the remainder of the day. In morning warm-up greg took it steady and played it safe going into the race. As the lights went out Greg got off to a decent start but the raced never quite panned out as he’d hoped for. Having pushed the pace in the early couple of laps Greg didn’t maintain the pace and found himself in somewhat of no mans land. Greg ended the 14 lap race 17-seconds down on 16th position having averaged a race speed of 93 mph. This was a steep learning curve for Greg and something he can use for the future. Greg is now 11th in the British 125GP Championship. Greg Greenwood: “For me this really wasn’t the best of weekends. I’d love to come here and get plenty of track time, build up my pace and learn the circuit more. I just lost too much time through the electrical issue and the torrential rain during second qualifying. This is such a fast circuit you need everything to be perfect and today I wasn’t their – I just didn’t enjoy myself. I know that Oulton is next weekend and I can show my true form there”. 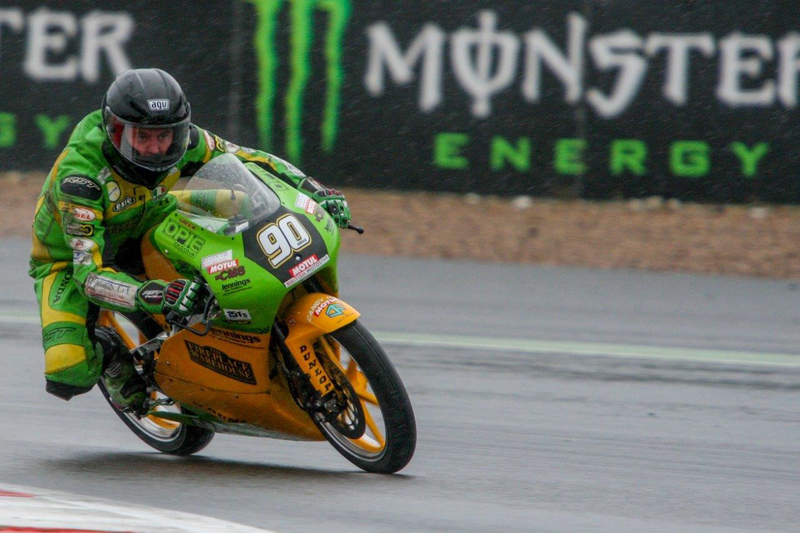 FPW Racing duo of Greg Greenwood and Milo Ward took to Donington Park in what can only be described as typical British weather. As both riders drove to the circuit is was clearly apparent that a day of wet testing was on the cards. Obviously not an ideal start to their 2014 season, especially as Donington is notoriously difficult in the wet conditions. Greg was more than aware of what he was up against and once out on track in the first session he set about relearning the circuit and gradually building up to speed. This was a very gradual process as the conditions remained the same all morning. 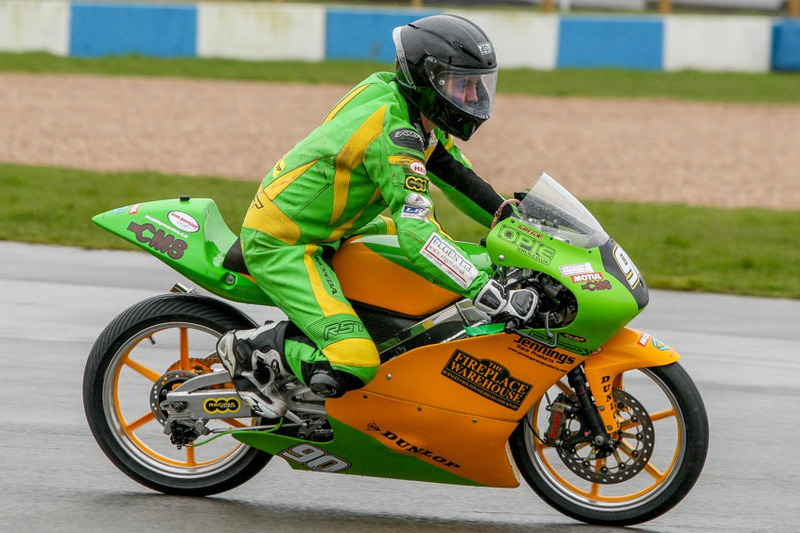 That said, Greg improved his times in every session and by the end of the day was a full six seconds faster than when he qualified in the Motostar championship in 2013 here at Donington. It was clear that this was a new Greg, buzzing with confidence and enjoying his riding like never before. Greg Greenwood: “I’ve spent all of the winter preparing my bike for today so it was finally good to get out and enjoy the day like I did. Everything felt right today and while I started slow I never felt on the edge as I built up my speed. Knocking six seconds off my lap time wasn’t something I expected so I am over the moon with that. 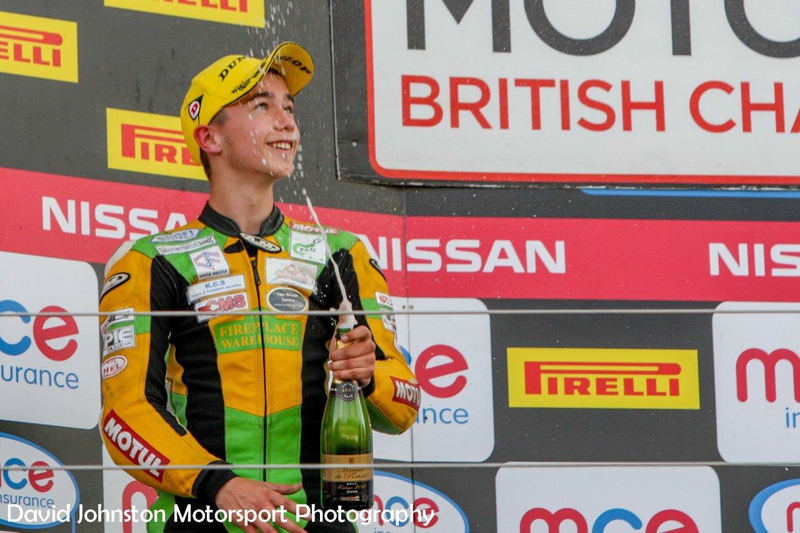 This is the best start to a season I’ve ever had and I can’ wait for Brands to come around”. This week also saw the team take delivery and fit a new 2014 spec Geo Technology S.A. Moto3 engine. 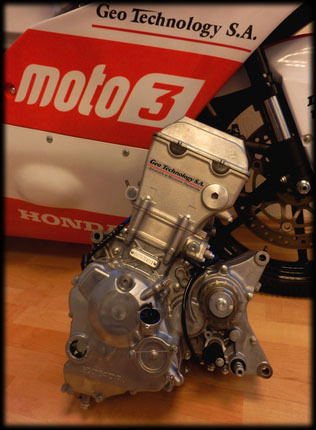 The company provides race ready Honda NSF250R engines to both world and national championship teams and for the past four seasons has built the 600cc Moto2 engine for the world championship. Geo Technology specified that the new engine provided has a 3 BHP increase in power over the 2013 engine and this is exactly what the team saw when we ran the bike on the team dyno this week. These are the upgraded (for 2014) version of the engine that Joe Francis to the title in 2013. This week the team took delivery of their Motul Sponsorship package and what a delivery that was. Support for the team comes from both Motul UK and our long term sponsor Opie Oils. The season supply will see the team use Motul lubricants in both it’s Moto3 and 125GP machinery. 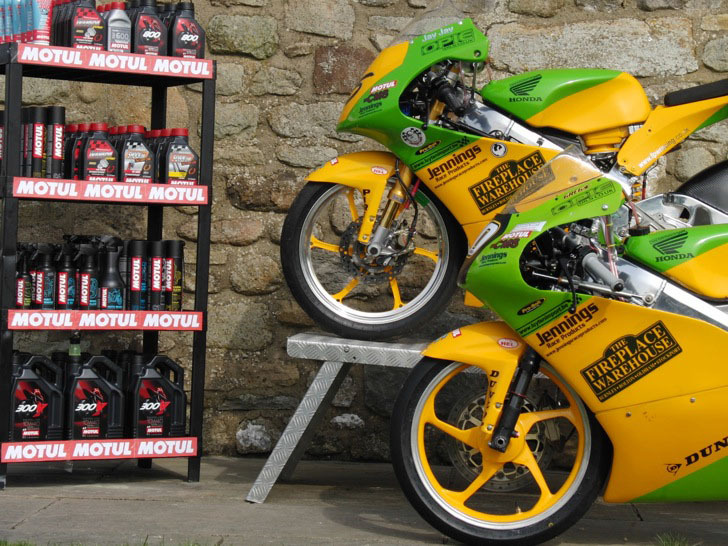 All of the Motul product line can be purchased from Opie Oils the UKs leading online distributor for both two and four wheels (www.opieoils.co.uk). Adrian Mason: “The new engine did exactly what the team at Geo said it would do when we ran it up on the dyno. The peak power is so impressive but it’s the torque that’s the real eye opener. The rider has the same level of torque throughout the racing rev range and I can’t wait to see this out on track. When all of the boxes arrived with the lubricants and cleaners it was quite humbling to see the level of support our five riders are getting. I cannot thank both Motul and Opie Oils enough for what they are doing. Interestingly we ran back to back tests on the Moto3 using a leading brand and our Motul 300V and we saw an improvement in power just as Richard Barrett had predicted. We are going into this season in a very strong position”.